TO REGISTER COMPLETE THE REGISTRATION FORM BELOW OR PRINT OUT AND RETURN A PAPER FORM. WE WILL SEND YOU YOUR CAMPAIGN STARTER KIT. 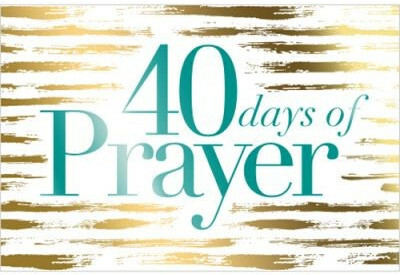 This 40 Days of Prayer Campaign Starter Kit contains examples of all the materials your church members and small groups will need to participate in this Campaign. 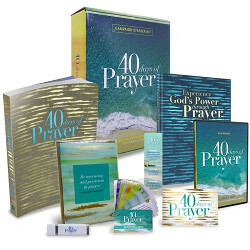 40 Days of Prayer Workbook: This all-in-one workbook is the hub of engagement for your participants during the campaign! The workbook contains the study guide for each small group lesson, daily prayer prompts throughout the campaign, space for weekly sermon notes, and suggestions for further study. Free Downloadable 40 Days of Prayer Sermon Series: Series taught by Pastor Rick. Campaign Poster, Bookmark, and Sticker: Sample, ancillary campaign materials to help promote the campaign throughout your church body, as well as keep the campaign top-of-mind as your participants learn life-changing prayer habits.